Before that, Yoshy tried to confirm such famous countries’ location on a globe. 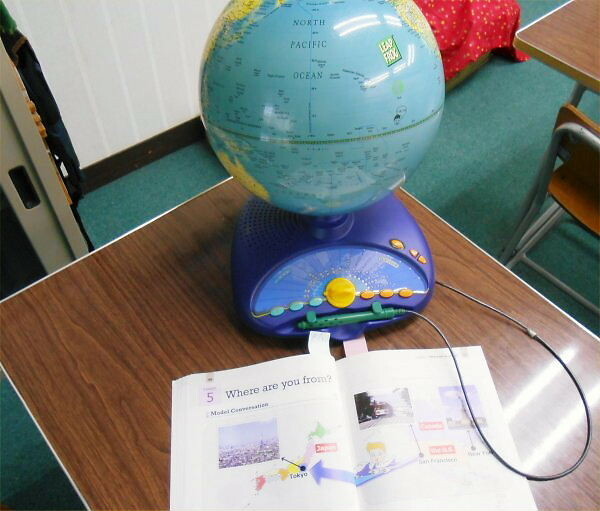 Yoshy used “a special globe called Odyssey which can say the name of cities, countries, etc in Japanese or English”. This Odyssey was displayed as a sample in Shihoya Bookstore. Yoshy had some students of PA touch when I say them the names in Japanese or English. Unexpectedly, most of them were able to touch only Japan. So I tried the same quiz at the class of PB, PS, PC and PD where the 5th and 6th graders are, too, having the same result. They said to me, “We didn’t learn the world map.” … Really? Yoshy did some lessons for the 5th and 6th of Arai Elementary School by using a world map or national flags when I was “the instructor of English Activities” in the year of 2009 and 2010. How are present English lessons there? Yoshy didn’t think they have touched a gourd at all. Though some of them knew what the gourd was, there was only one who have touched it before. The real has much of presence. LL Shihoya Arai School is so to speak a learning laboratory of virtual space. There are many kinds of stuffed animals which are used a lot in some games. E.g. these gourds were used in PD. The key Q-As were “Are these ～?” – “Yes, they are. / No, they aren’t. They are …” We could review their learned expressions.